Building on the success of last year’s event, ‘Cornwall Day for Nature’ on 3rd and 4th August promises even more opportunities to enjoy nature first hand. 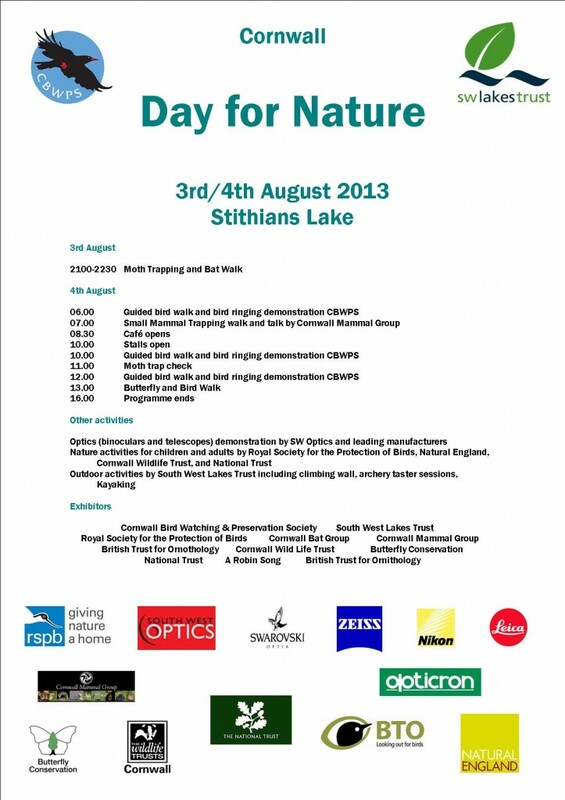 The event is sponsored by South West Lakes Trust and will be held at Stithians Reservoir. On Saturday 3rd August the event will start with an evening focused on Moths and Bats, where you can find out about nature in Cornwall at night with local specialists running moth traps and taking a bat walk (subject to weather). Overnight on site camping is available. Sunday 4th August will start with an early morning ‘Dawn Chorus’ walk to a bird ringing site and a small mammal trapping demonstration, which will be followed by a range of walks during the day. Conservation Groups will exhibit and publicise their conservation work and activities providing a great opportunity to get find out more and involved! Exhibitors will include Cornwall Bird Watching and Preservation Society (CBWPS), South West Lakes Trust, The National Trust, Natural England, Royal Society for the Protection of Birds (RSPB), British Trust for Ornithology (BTO), Cornwall Wildlife Trust (CWT), Cornwall Bat Group, Cornwall Mammal Group, Butterfly Conservation and an introduction to the Robin Song Project, a South West Children’s Hospice Project to bring wildlife into the lives of children. Fun for all ages! The National Trust, RSPB, Natural England and the Cornwall Wildlife Trust Fox Club will be offering nature themed fun for children of all ages. The National Trust will have with their arts and crafts marquee, together with demonstrations of green woodworking and bush craft. Come and talk to their Rangers about the ongoing work for wildlife on the spectacular Lizard coastline, where choughs and rare plants abound. Try and buy the latest optical equipment for all price ranges! Trade exhibits will feature South West Optics, Leica, Swarovski, Nikon, Zeiss and Opticron. Local wildlife artist, Griff, founder of the Robin Song Project for the South West Children’s Hospice, will be displaying his work in the marquee. South West Lakes will be offering kayaking, archery and climbing wall taster sessions (a small fee will apply these activities to cover costs). Refreshments will be available at the popular Watersports Cafe within the complex to eat and drink inside or on the lakeside. It will be a free event but we do hope to raise some funds for a new proposed viewing screen at College Reservoir and on going conservation work at Stithians Reservoir.